If we haven’t officially met, my name is Mark Lovett, and I know Web Design and SEO. 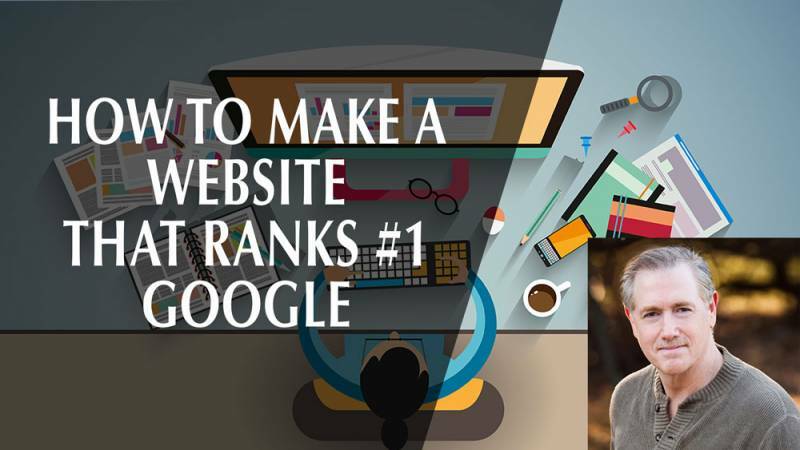 Today, I’m going to show you how to make a WordPress website rank #1 in Google. I’ve been creating websites that rank on the 1st page of google for clients and my own businesses for a long time. I’ve also been helping entrepreneurs learn how to use their WordPress websites, and other tools, to grow their businesses online. 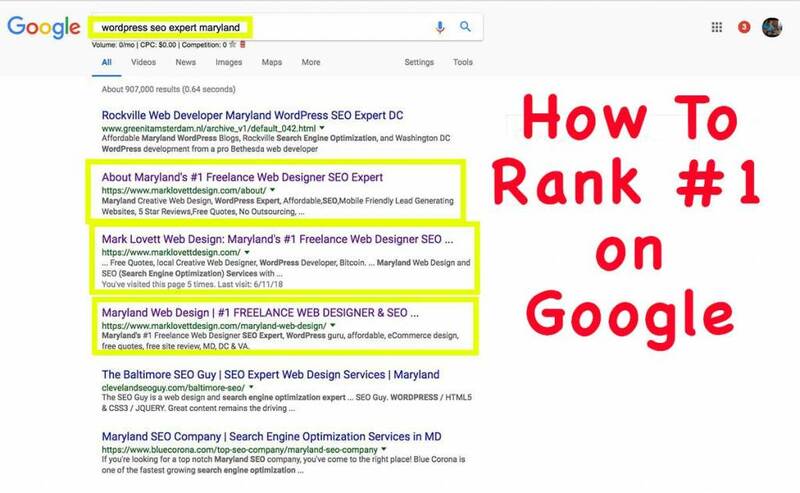 If you do a quick google search for web designer or WordPress web designer, you’ll see that I dominate the search results in my area, and I’m going to take you step by step and show you how I do it! This YouTube Livestream Event was held on 7/1/18. Scroll down to watch the event video. So Let’s Get Started! This is how I do it. 1. Purchase a domain Purchase a domain for your business using your key words such as lovettwebdesign.com has the keyword ‘design’ in it, and seogld.com has the keyword ‘seo’ . The shorter the better. Self-hosted means you’re using a domain like mydomain.com not a domain like mydomain.blogspot.com which has very poor SEO. 5. Hosting – Use A good quality website host for your site like Siteground.com. 6. Mobile Friendly & Responsive – Make sure your site is mobile friendly and responsive. 50% of users will be using a smart phone and it’s rising rapidly. Responsive means the site looks great on various screen sizes. 7. Use a great Premium Theme – Don’t reinvent the wheel. Save money by using a top quality theme, such as Avada (300k + sales), and choose one of their templates that looks close to the design that you desire. Using a popular theme means it will work well, the authors will keep it up-to-date, and will it be well supported. 8. Create Pages for your main services or products and link them in the main menu. 9. Write compelling content in pages with Calls-To-Action using your business keywords in titles and headings. How do you write compelling content? Start by writing posts that would be interesting and helpful to your customers and potential customers. 10. Create a blog on your site – write compelling articles about subjects closely related to your services or products using your business keywords in titles and headings. 14. Create meta titles and meta descriptions for each page and post, and enter them in the Yoast plugin. This is what the search engine will see and display. 15. Links – Add links in your content that link externally to authority sites like wiki. Add links in your content that link internally to other content within your site. Is the information that I’ve given you so far helpful? Please write ‘YES’ or ‘NO’ in the comments below right now. 16. Screen Size Styling – View Site on Different Screen sizes and adjust the styling and formatting so it displays well on all of them. 17. Create an xml site map and submit to search engines so they can index your site. Yoast plugin has the site map built-in. The sitemap tells google what content to index. 18. Add website to Google Search Console – Google Search Console is a no-charge web service by Google for webmasters. It allows webmasters to check indexing status and optimize visibility of their websites. 19. Set up account in Google Analytics – Google Analytics is a freemium web analytics service offered by Google that tracks and reports website traffic. 20. Google My Business– add your business listing to google my business for google maps visibility. 22. Citations/Local Listings – Consistent NAP – A local citation is any online mention of the name, address, and phone number for a local business. Citations can occur on local platforms business directories, on websites and apps, and on social Citations help Internet users to discover local businesses and can also impact local search engine rankings. 25. Email Sign-Up Form – create an email signup form that will build an email list in Mailchimp, then create and send out branded emails to list. 27. Create an Online Community – Create an online community using social media around your business. If this has helped you please LIKE it on facebook and youtube. Please Subscribe to my Youtube Channel, and Join my Facebook Group. Also comments below will be much appreciated, and any questions will be answered.